← Let’s get Hammered! Or, HammerKNIGHTed. You are correct, Gero, they are indeed underwater. I have read the comic in question and despite an English degree, have no clue why there are bear traps underwater. And while I do NOT have a degree in Physics, I also cannot understand why she would have floated head-first upward into the bear trap trigger, allowing it to close on her cone head. I love this comic almost too much for words to express. It’s the gift that just keeps on giving. I must say, what… the… hell. First of all what is a bear trap underwater? (agreeing with you guys) And second of all, what is it doing, while set, floating upside down? Just pointing those out because that is JACKED UP. Well this time, at least, you can’t blame her for being taken off-guard. Who could’ve seen this coming? Is it just me, or does Bulletman look like a porpoise in profile there? Heh. No harm done. 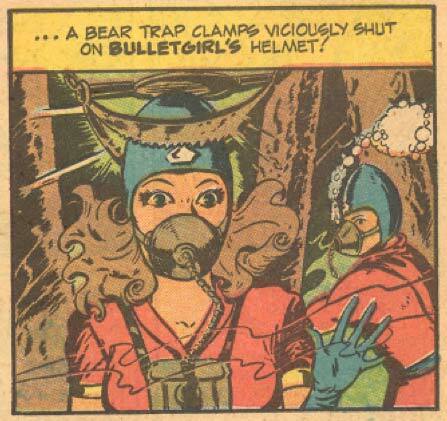 You have to get something more vital than the head to stop Bulletgirl. They don’t look all that surprised/worried. That panel, on this day, is the textbook definition of awesomenicity. The sheer logistics of underwater floating bear traps … it makes the heart sing. It’s like frickin’ sharks with frickin’ lazer beams on their heads. Is that so much to ask for? @John: Congratulations on inventing the first new word of 2010! Trees in the background and a beartrap underwater. Sounds like Rob Liefeldism to me. So, Rob wasn’t the first to be afflicted with this sickness, he is just the most popular and since the disease wasn’t yet named, it became named after him. On a side note, the word popular refers to Robby being well known, not well liked.